Village Point townhomes for sale lie in tightly knit buildings located at the entrance to the Warriors Mark neighborhood, close to Highway 9. For this reason, they are easily accessed by car, especially from the south and the Colorado Springs area, and offer a variety of floorplan styles from one-bedroom to three or four bedroom units. 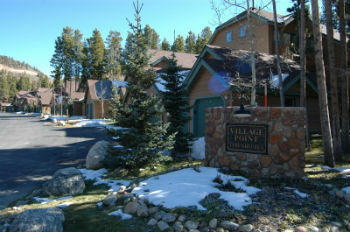 The location of Village Point also make it an easy walk to downtown Breckenridge; across the street the trail begins, snakes around the Main Street Station, and veers off to the Village, which is the base of Peak 9. The Quick Silver lift loads just south of the Maggie Pond at the south end of this area called the Village. Main Street and the core shopping area is just north of Main Street Station. You will find available Village Point townhouse listings below, or you can read more information about the surrounding community. Village Point Townhomes were built in the 1990s and were constructed in a simple woodframe style that makes them unadorned but timeless. From the outside they may look similar but these townhomes over a lot of variety inside. Most of the Village Point Townhomes have garages and basements and each one will have different attractions for each owner, and real estate buyer. There are three floors of townhomes, and most are one one level. Size: 540 sq. ft to 2194 sq. ft. Amenities: close to Peak 9 base area, walk to town, on bus route, near Hwy 9. On the southside of town, with off street parking. Electric heat? No garages. Drive south on Main Street to last stoplight at Boreas Pass Road, turn right on Broken Lance Drive. At the three-way stop, turn right to remain on Broken Lance and Village Point Condo’s driveway is the second left. An expert from Breckenridge Associates is waiting to talk to you! You can contact us online, or give us a call at (970) 453-2200.